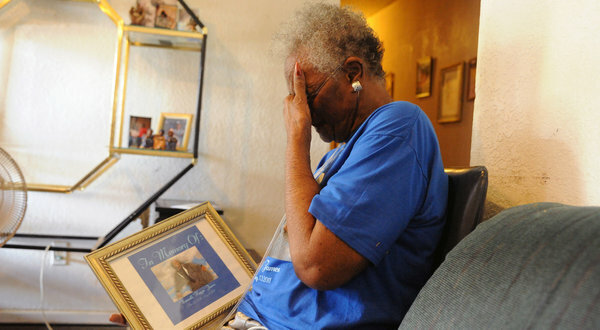 Mary Lou James, the mother of Kenneth Wayne James, 52, who was found in his cell with a body temperature of 108 degrees. To prisoners within the Texas Department of Corrections owning, or not owning, a fan can mean the difference between life or death. In 2011 eleven prisoners died from heat related causes. In June of 2012 Scott Medlock and the Texas Civil Rights Project filed a wrongful death lawsuit against the prison system on behalf of the family of Larry Gene McCollum, who died of a heatstroke at the Hutchins State Jail. What began as a one year jail sentence became the death penalty. When McCollum entered the jail, Medlock said, officers welcomed him with the phrase "Welcome to hell," an ominous metaphor that proved to become a virtual truth. There are thousands of Texas prisoners who have no money in their Trust Fund accounts. These inmates are referred to as "Indigents. " Prisoners who do have money are allowed to go to the commissary once per week and purchase toiletries, foodstuffs, ice cream and soda pop, etc. Indigents never enjoy a bite of ice cream or a sip of soda pop, unless a buddy with funds shares with them. Prisoners with funds may also buy electric fans. It's always heartwarming to hear from indigent inmates who have just received their free Texas CURE fans. You can help bring joy to an indigent prisoner by donating $20.00, the price of a fan, to the Texas CURE Fan Program today. Money donated on this page is used only for fans. Texas CURE is a 501 (C3) nonprofit organization. Donations are tax deductible. Since our inception we have purchased 6000 fans for indigent Texas prisoners, 570 last year. Our goal for 2013 is 1000 fans. Please help. Texas is now in triple digit heat and our indigent prisoners are literally sweltering in their own juices. Last year Texas CURE provided 1000 fans to prisoners without funds at a cost of $20,000. This year we have only raised enough money to pay for 14,000 fans. Please , give what you can to help us at least meet last year's total. No human being should have to suffer temperatures of 130 degree heat in a prison cell or dormitory. We need YOUR help. Just writing this small missive to thank you for the fan I received this month. God Bless All of you in this project for caring enough to answer my request. I will pray to our Lord that He may continue to Bless all of you and the people who made the donations to make this possible for me. Thank you and God Bless you!!" We are happy to announce that the Human Rights Clinic at the University of Texas School of Law has just published a follow up report, Reckless Indifference: Deadly Heat in Texas Prisons. The Report is based on the Clinic’s continued work addressing the deadly heat in Texas prisons and on several on site interviews with inmates in different TDCJ units. The heat in Texas prisons is so severe that at least 14 inmates have died since 2007 in Texas Department of Criminal Justice (TDCJ) facilities, despite the fact that the TDCJ has been aware of the problem for years. Whether through litigation, letters from legislators, pleas from inmates and their families, or the previous report that the Clinic published last April, the TDCJ has been continuously reminded that the heat in its prisons is killing people. While the Texas Commission of Jail Standards (which administers county jails) has regulations about temperature range, the TDCJ has no such standards. This means that during the summer, temperatures inside the living areas in TDCJ facilities regularly exceed 100 °F, and the Clinic has found daily temperature log sheets that indicate that the heat index (which factors in humidity and represents what the temperature feels like) has reached 149 °F. Courts have found that similar conditions constitute a violation of the Constitution’s prohibition of cruel and unusual punishment. There are currently several pending lawsuits against the TDCJ to address the issue. The United Nations Committee Against Torture (CAT) has also expressed serious concern about the heat in Texas prisons. In addition to the United Nations, the Inter-American Commission on Human Rights (IACHR) shared the same concern, and as CAT requested that the TDCJ investigate the deaths of inmates in its facilities. There are several recommendations that the Clinic makes in the new report to address the issue. They range from immediate remedial measures as well as long-term systemic changes. The most urgent is to provide inmates with ice and cool water and to allow them to take as many showers as needed to lower their body temperature. They should also place inmates who, for a variety of reasons are more susceptible to heat related injuries such as heat stroke, into separate areas that are cooled. The TDCJ should also screen and monitor all inmates to assess their susceptibility for heat related injury. There should be an official permitted temperature range of 65 °F to 85 °F, and in order to achieve this air conditioning should be installed in all facilities. Finally, the TDCJ should change its grievance procedures—which inmates insist is not designed to actually provide any relief—so that legitimate complaints can be investigated and addressed. The Clinic calls on the Texas legislature to adopt immediate measures to address the deadly heat in its prisons. Please do not hesitate to contact us if you need any further information on this issue. sending in $20.00 postal money order in the morning. Coming from a inmate at Ramsey Unit, Paying It Forward! This is a very good thing you're doing.